BlackBerry is out to build a better messaging system through BBM on Android and iOS devices, and to do that it's helping users build their contacts with an easier method of adding friends. Today's update adds a much-needed Find Friends feature to the BBM app that's available through the Google Play Store and Apple's App Store. Previously, new contacts had to exchange annoying 8-digit PINs through texts, emails or slightly more convenient QR codes. BlackBerry had previously said it valued this method for message-controlling privacy reasons, according to the BBM app's previous release notes. There's no need for extra-stringent privacy controls if no one is using your app in the first place. Although BBM launched to some success, it still faces competition from the popular WhatsApp client and native messaging services like iMessages and Google Hangouts. 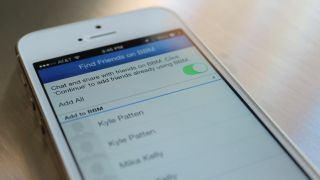 The Find Friends feature could not only connect more people who are currently using BBM, but it could also lure more unregistered users to the BlackBerry service. BBM has an unmissable "Invite to Download" list of all of your phone or tablet's contacts that haven't signed up for the messenger. Clicking on a name gives you the option to invite them by email and text, which means BBM could quickly grow from its current loyal confines and give us less depressing BlackBerry news one day. Check out our review of the Samsung Galaxy Note 3, the biggest BBM-using phone around.